In a huge correction yesterday, prices shed over $4/bbl, with products seeing losses upwards of 10 cents per gallon. This morning, WTI crude is trading at $56.53, up 84 cents. Yesterday truly shook up the fuels markets, with both gasoline and diesel seeing nearly 10-cent losses. Gasoline took the larger fall, shedding 8.7 cents (-5.4%), while diesel declined 9.3 cents (-4.3%). This morning, gasoline prices are $1.5586, up 1.6 cents from yesterday’s close. Diesel prices are $2.1074, up 4.5 cents. For almost a year now, analysts have noted that bears have been too nervous to sell, spurred by OPEC’s commitment to produce more and Iran sanctions – that logic has clearly broken down over the past few days. But what’s changed in the last few weeks to bring oil down $20/bbl in just over a month? The news has been bearish for the past few weeks, but not outlandishly so. On the supply side, OPEC production has been rising despite declining output in Iran and Venezuela. Simultaneously, US output has been climbing to new record levels, and Russia is shooting to set their own production records. On the demand side, emerging economies have been slowing and the US stock market just went through a significant correction. So the fundamentals do point to pretty bearish trends – yet the forecasts for supply/demand balance in 2019 have not changed that significantly. The EIA’s most recent report shows an average 0.6 MMbpd build in 2019. Importantly, OPEC is signaling their commitment to play the swing producer, and Saudi Arabia is already voluntarily cutting production in December by half a million barrels per day. 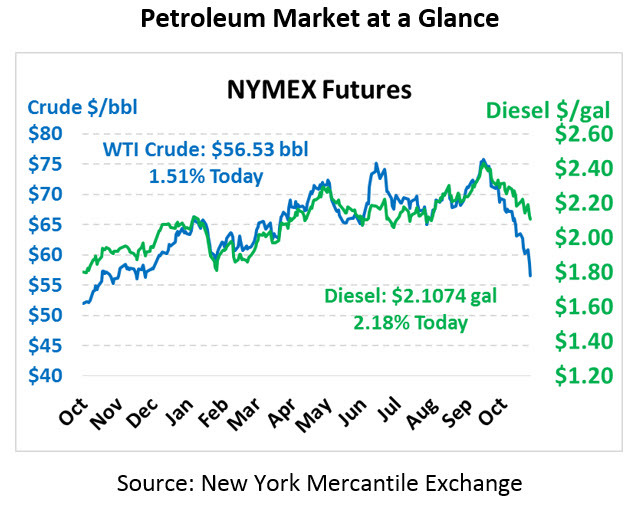 Lastly, it’s important to remember that diesel and gasoline prices may not necessarily track crude’s decline. As we noted before, crude is trading at its lowest point this year, but diesel prices are still 20 cents above their 2018 lows. Upcoming marine regulations – IMO 2020 – will continue to put upward pressure on diesel prices, so it will take some sizable crude oil losses just to keep diesel flat in 2019 relative to 2018. In summary – bargain-shopping consumers are enjoying the latest price action this week. 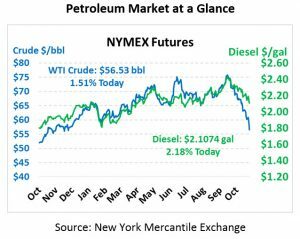 The fundamentals outlook for 2019 remains relatively bullish, at least for diesel prices, and for prices to fall any lower is possible but not sustainable given supply and demand trends. OPEC will not allow markets to fall so low in 2019, and markets seem to have forgotten (temporarily) about the risk premium typically associated with balanced supply markets.